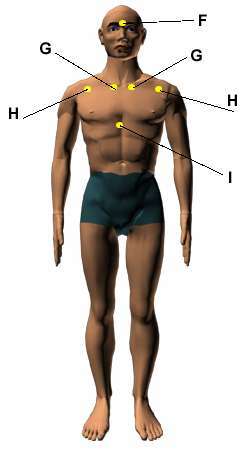 There are the acupressure points for relieving Depression . Working on these points can help you get better quicker. You do not have to use all of these points. Using just one or two of them whenever you have a free hand can be effective. Location: Below the base of the skull, in the hollows between two large neck muscles, two to three inches apart depending on the size of the head. Benefits: Relieves depression, headaches, dizziness, stiff necks, and irritability. Location: One-half inch below the base of the skull, on the ropy muscles located one-half inch out from the spine. Benefits: Relieves emotional distress, burnout, exhaustion, depression, and heaviness in the head. Location: Between the shoulder blades and the spine at the level of the heart. Benefits: This calming point helps to balance the emotions. It relieves anxiety, grief, and other emotional imbalances. Caution: Do not press on disintegrating discs or a fractured or broken bone. If your back is in a weak condition, lightly touch these points, keeping your fingers stationary and exerting no pressure. See your doctor first if you have any questions or need medical advice. 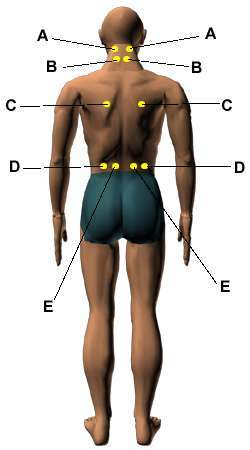 Location: In the lower back two (Point E) and four (Point D) finger widths from the spine at waist level. Benefits: Relieves depression, fatigue, exhaustion, trauma, and fear . Location: Directly between the eyebrows in the indentation where the bridge of the nose meets the center of the forehead. Benefits: Relieves depression as well as glandular and emotional imbalances. Location: In the indentation between the first rib and the lower border of the collarbone, just outside the upper breastbone. Benefits: Relieves anxiety, depression, chest congestion, breathing difficulties, asthma, coughing, sore throats, and premenstrual tension. Location: On the outer part of the upper chest, four finger widths up from the armpit crease and one finger width inward. Benefits: Relieves depression, grief, repressed emotions, shallow breathing, chest tension or congestion, coughing, asthma, and skin disorders. Location: On the center of the breastbone three thumb widths up from the base of the bone. Benefits: Relieves nervousness, chest congestion, grief, depression, hysteria, and other emotional imbalances. 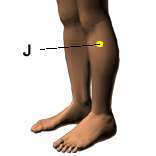 Location: Four finger widths below the kneecap, one finger width on the outside of the shinbone. Benefits: Strengthens the whole body, tones the muscles, balances the emotions, and relieves fatigue, and counteracts depression. Location: one inch in front of Points (L) Benefits: Relieves depression, headaches, and vertigo, and improves memory. 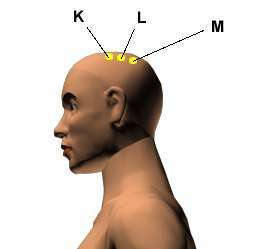 Location:on top center of the head, by placing the left fingers behind the left ear; the right fingers behind the right ear. Move the fingertips up to the top of the head,center of the head. Benefits: Relieves depression, headaches, and vertigo, and improves memory. Location: one inch behind of Points (L) Benefits: Relieves depression, headaches, and vertigo, and improves memory.